The Little Brute Family and The Stone Doll of Sister Brute are utterly lovable, completely hilarious and thoroughly unforgettable. 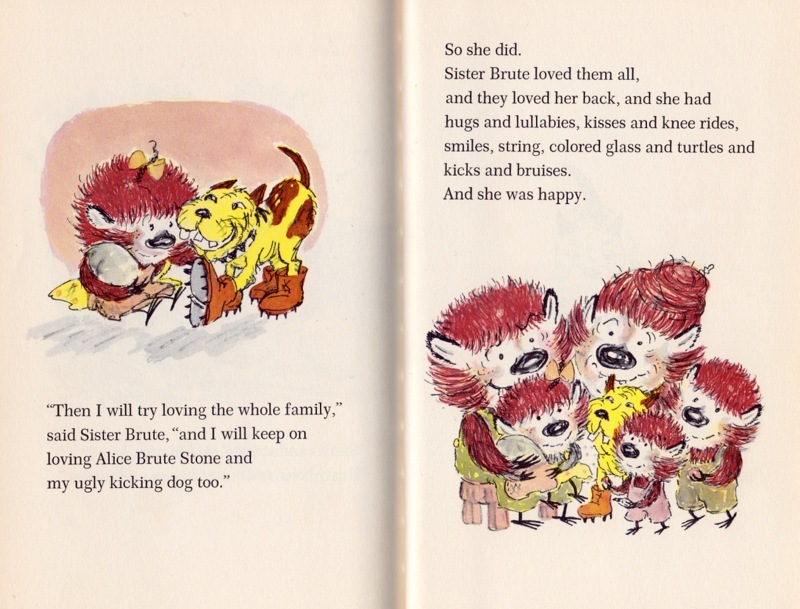 The husband and wife team of Russell Hoban (1925-2011) and Lillian Hoban (1925-1998) were a giant force in the world of children’s books. 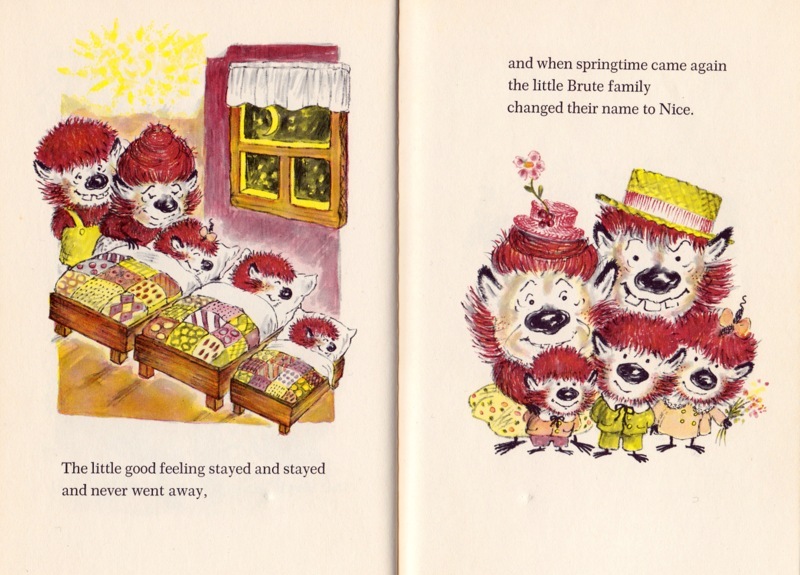 Together the pair created Bedtime for Frances (as well as several other Frances books) and Emmet Otter’s Jug-Band Christmas (which is the basis for the fantastic Muppet special). Their stories are sweet and funny and are imbued with valuable life lessons; their characters are endearing and identifiable. 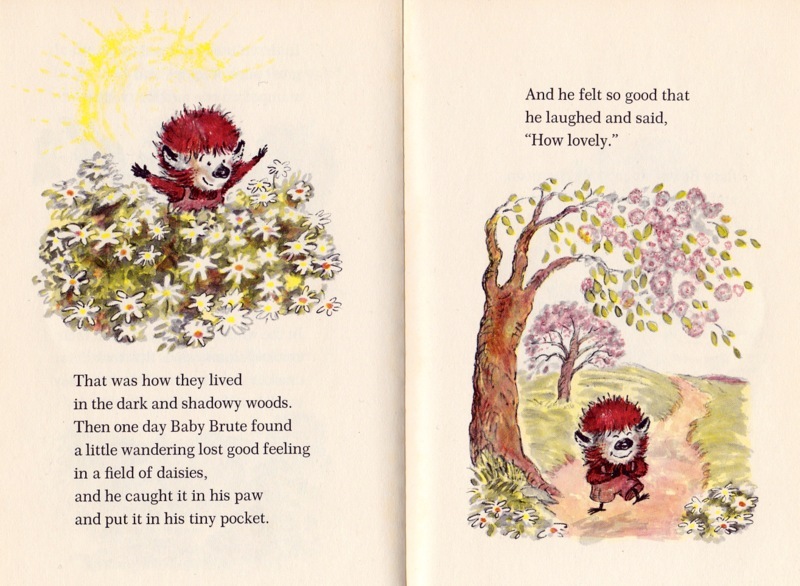 These farcical stories featuring grumpy characters make for two truly adorable books. Russell Hoban’s writing is charmingly droll; Lillian Hoban’s art is delightful. Though the images are small, they’re saturated with life. Her depiction of the Brutes is marvelously comical and readers will quickly fall in love with their homely faces and bad attitudes. 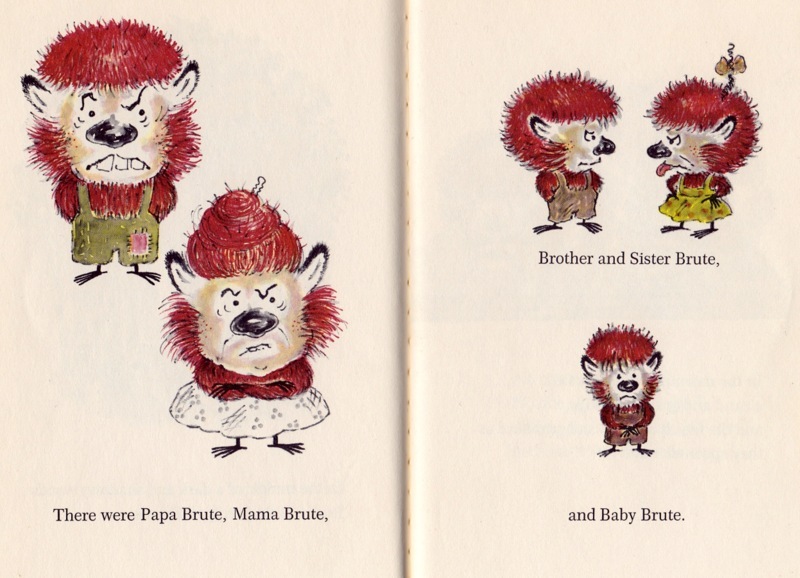 The Brutes—Papa Brute, Mama Brute, Brother Brute, Sister Brute and Baby Brute—were unhappy and angry creatures. No one ever said “please” or “thank you.” During mealtimes, Brother and Sister would kick each other under the table while Mama and Papa made faces. For breakfast they ate sand and gravel porridge; for dinner Mama made stew from sticks and stones. In the spring the little Brutes made kites that were too heavy to fly, so they dragged them on the ground. 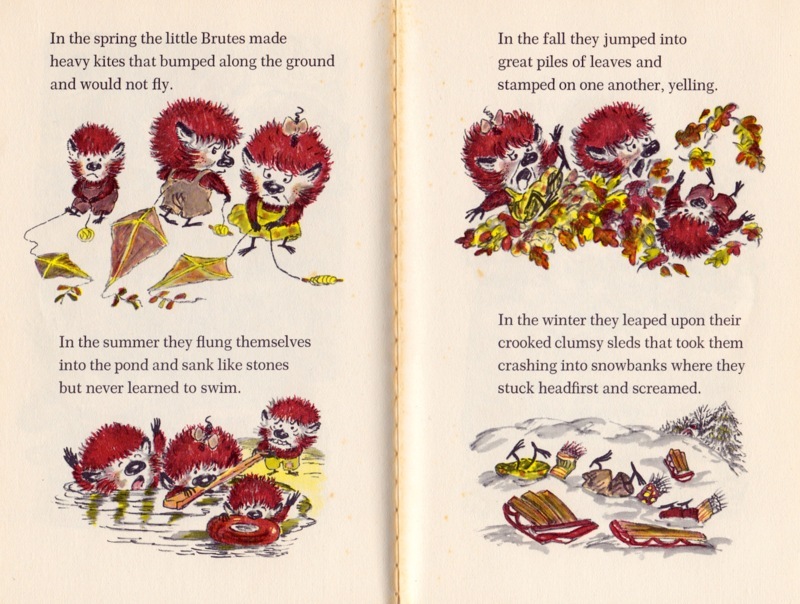 In the fall they jumped into piles of leaves and stomped on each other, yelling. The good feeling spread quickly throughout the Brute family and they wished for it not to hover, but to stay. The following day, instead of collecting sticks and stones for stew, Papa collected wild berries, salad greens and honey. In the spring the little Brutes made kites they could fly instead of drag; in the fall they collected nuts and acorns to roast by the fire. The contrast between the brutish behaviors and the new nice attitudes makes the nice parts all the more satisfying. The Little Brute Family provides a gentle reminder to focus on the good parts of life, in a heartwarming and hilarious way. Sister Brute loved it anyway. She drew a face on it, made it a dress and named it Alice Brute Stone. 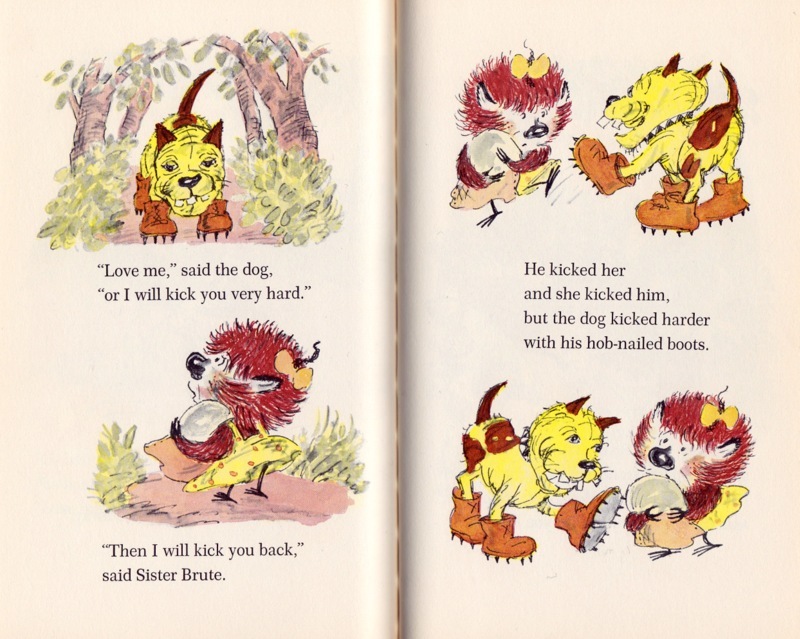 One day, while Sister Brute and Alice Brute Stone were out walking, they encountered an ugly dog in hobnailed boots demanding to be loved. Though Sister Brute explained that she already had something to love, the dog threatened her. Then he kicked her! Sister Brute kicked back but her kicks weren’t as hard because she wasn’t wearing hobnailed boots. Sister Brute threw her stone doll at him but, since nobody ever played dolls with him before, he thought Sister Brute was playing and took this as proof of her love. 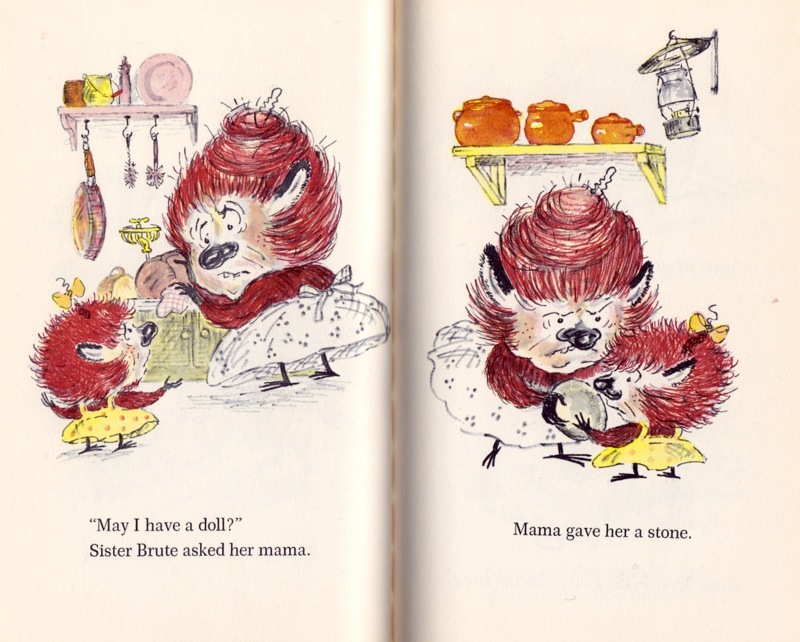 When Sister Brute asked what else she could love, Mama said, “I don’t know.” It was then that Mama noticed Alice Brute Stone’s face, the one Sister Brute drew herself, and it looked just like hers. Papa would give her kisses and knee rides. Brother had smiles and string to offer, and Baby had rusty bolts, colored glass and turtles to share. 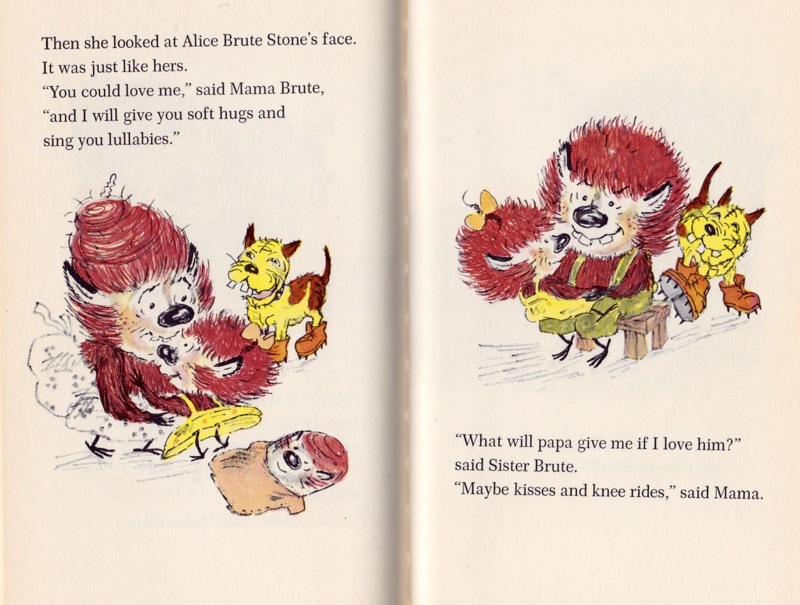 Sister Brute realized she could love Mama Brute, Papa Brute, Brother Brute, Baby Brute, her stone doll, and her kicking dog. As many times as I’ve read these books I never fail to laugh, a lot, and I love them more and more each time. Cracked Corn and Snow Ice Cream: A Family Almanac is a treasure for the whole family. An almanac is defined as an annual calendar containing important dates and statistical information. Readers may be familiar with The Old Farmers Almanac. Published annually, it contains—among other things—weather forecasts, planting charts, astronomical data, and recipes for the coming year. As a child I was fascinated by it. It seemed to be able to predict weather for specific days, and general weather patterns for whole seasons with remarkable accuracy. Looking through its pages always made me feel as though I were living in a different time, yet it was full of information pertaining to the future. It was like a book of magic. This family almanac, created by Nancy Willard and Jane Dyer, is also a book of magic. Willard gathered stories from her grandmother’s family, of life on a farm in the Midwest, at the turn of the century. When Dyer heard the stories, she was reminded of her own family’s past and their roots in Kansas. Though a snapshot of a different time, there’s helpful advice that can be used today. It’s temperature, not light, that helps to ripen tomatoes; a slice of lemon rubbed on your hands will help rid them of stains. While some of the information is not relevant to current, daily life—like reminders to cut your ice and tips for storing it properly—it’s still deeply engrossing. Nancy Willard won the Newbery Award in 1982 for A Visit to William Blake’s Inn: Poems for Innocent and Experienced Travelers. (That same year Beverly Cleary’s Ramona Quimby, Age 8 won a Newbery Honor.) Willard is a poet, a novelist and a picture book writer. Her writing is beautiful and full of energy, immediately drawing readers into the life of the characters. 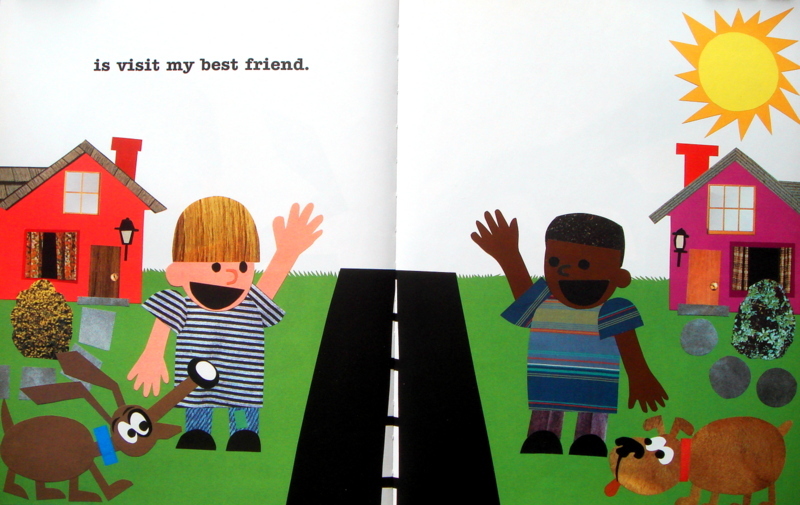 Jane Dyer has illustrated several books, including Time for Bed, written by Mem Fox, one of my favorite books for babies. Her art in this book is superb. It’s delicate and vibrant and imbues the text with nostalgia. Each month spans four pages and contains several sections. “Dates and Festivals” features fixed holidays, birthdays of notable figures and important dates in history. “Variable Feast Days and Holidays” highlights celebrations that fall on varying days each year. The “Farmer’s Calendar” offers planting information, tips for the care of livestock and tips relating to nature. “Worth Knowing” and “Worth Cooking” contain facts and recipes respectively. Each month closes with “The Voices,” direct quotes from Willard’s family members giving readers a personal glimpse into life on a farm in the early 1900s. Photographs of the people speaking in “The Voices” are featured in double page spreads, which separate the seasons, leaving a more lasting impression of times past. There’s a section that appears in a few of the months labeled “Cow Facts” where readers learn that thirty-three cows fit in an average classroom! And when milking a cow by hand, a gallon of milk contains 340 squirts. Amongst all these features are poems, spells, old sayings, birthstone information, etymology of the names of the months, old wives tales, and myriad other tidbits. Dyer’s amazing art is sprinkled throughout—covering a quarter page and accompanying a poem, or as a small detail along side a special date. She’s also created colorful and ornate hand-lettering to break up the traditional black type. Use this book as a template to create your own family almanac, as a lesson on life in a different era, or as a reference for wonderful old-world recipes. Break it out at the beginning of each month to discuss upcoming holidays, or to aid in your planting schedules. Or just read through it and marvel at a lifestyle of not so very long ago, but far removed from our current way of life. 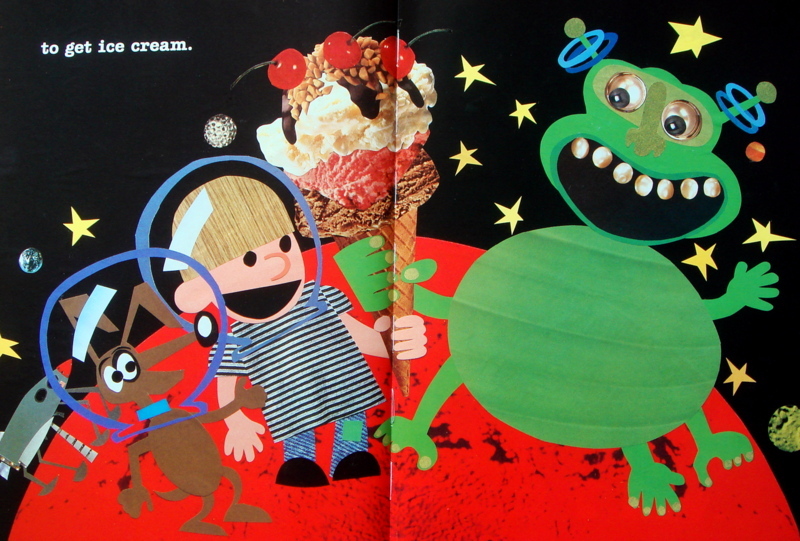 However read, Cracked Corn and Snow Ice Cream is a treasure for the whole family to share. Mordant’s Wish: A magical series of events that ends with a new friendship. In the interest of full disclosure, I must admit I am partial to stories that involve turtles. This preference would never sway me into appreciating an unworthy book, but it may persuade me to love a good book just a tiny bit more. Valerie Coursen uses a soft, colorful palette and her illustrations are playful and loose. Her charming prose is uncomplicated; the story follows a series of actions and their consequences. Each new page brings a little more of the town into view and connects one event to the next, resulting in a heartwarming and magical ending. Mordant (a mole) lives in a hole at the top of a hill. Staring up at the sky, he sees a cloud shaped like a turtle. He blows on the seeds of a fluffy dandelion puff and wishes for his turtle friend. The white seeds fill the air and an incredible chain of events is set in motion. 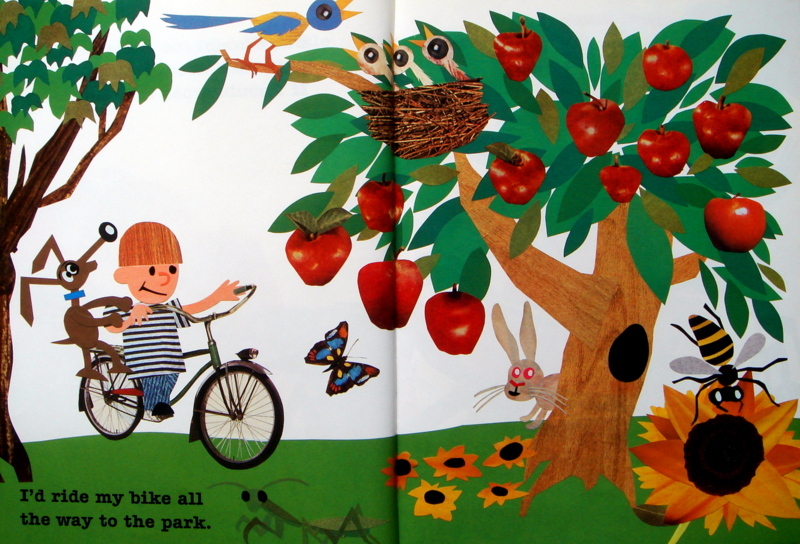 Calum, riding by on his bike, sails through the downy seeds and thinks of snow. Then he thinks of snow cones, so he makes a stop at Velma’s Famous Snow Cones. While he’s enjoying the treat, some of Calum’s frozen delight drips onto the sidewalk forming a hat-shaped puddle. When Peanut the bird, perched above, sees the puddle she thinks of her Aunt Nat, who owns a hat that very same shape. Peanut decides to pay her aunt a visit. Aunt Nat is overjoyed to see Peanut and begins singing a very happy song. The barber, Mr. Ricardo, hears the song and is so content humming along that he shaves a smiley face onto the back of Mr. Took’s head! Blanche the beetle lives in the Fine Fine Antiques shop, where Mr. Took likes to shop. Blanche is depressed over the sale of her favorite buttons—“the pearl ones with the red roses painted on them”—until she spots the cheerful image on Mr. Took’s head. Though just moments ago she’d been crying, she is so cheered by his new, daring hairdo that she decides to do something daring herself. Blanche hops onto a package headed out the door, then she hops onto a woman in a flowery dress. Quickly flicked away by the woman, she soon finds herself on a beautiful, sweet-smelling rose. The woman wearing the flowery dress didn’t notice that she dropped her grocery list, nor did most of the people who walked right over it. It was Petunia Mae who picked it up. She liked looking for secret messages in lists and, by combining the first letters of the items on the list, this one was telling her to swim. While on her way to the lake, Petunia Mae notices a turtle trying to cross the busy road. She doesn’t know that he tries every day but is too afraid of the cars, or that the reason he wants to cross the street is to find out who lives at the top of the nearby hill. 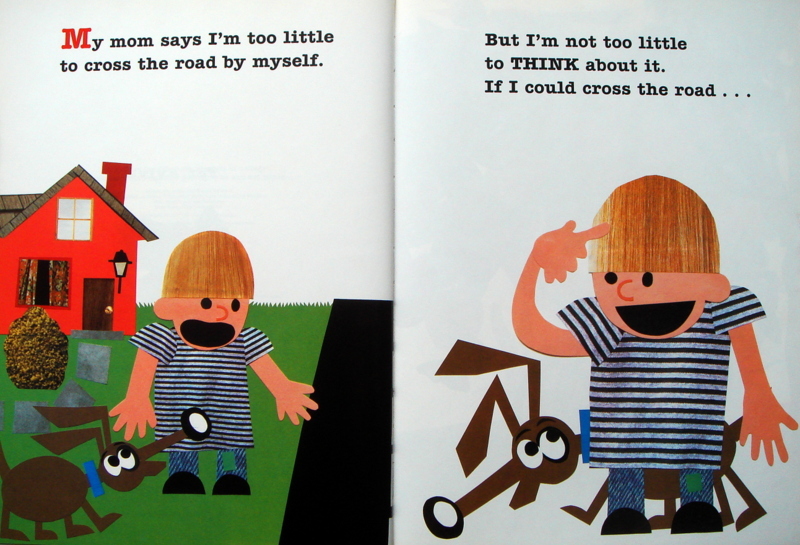 Petunia Mae picks up the turtle, crosses the street, and gently places him on the grass at the bottom of the hill. Mordant’s wish is about to come true, and so is the turtle’s. Company’s Coming: Great fun for the whole family. 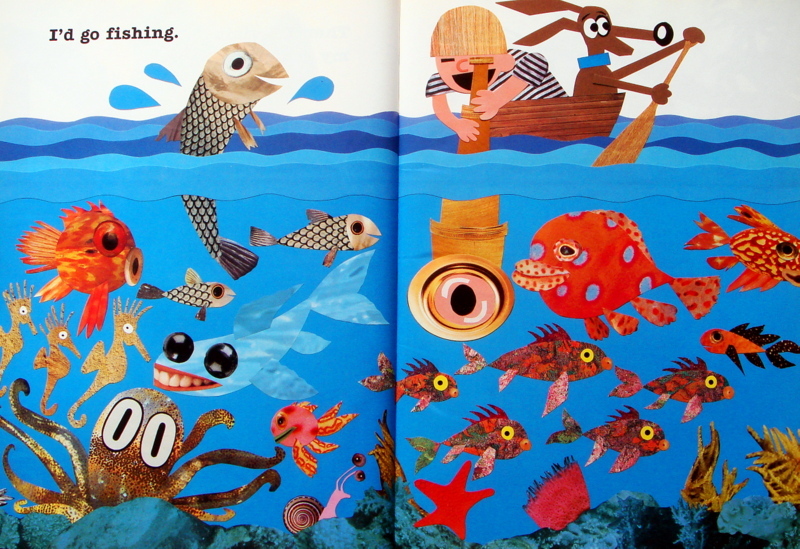 Arthur Yorinks has written several books for children, including Hey, Al, illustrated by Richard Egielski, which won the Caldecott Medal in 1987. His text in Company’s Coming is humorous and pleasing—with some surprising and hilarious turns. David Small is an author as well as an illustrator, and has published a lengthy list of wonderful books. His book, The Gardener, written by his wife, Sarah Stewart, was awarded a Caldecott Honor. He won the Caldecott Medal for So You Want to be President? in 2001. Small creates familiar and natural scenes using rich colors and delicate lines. His fine, detailed art is incredibly satisfying. Shirley and Moe are enjoying a pleasant afternoon while preparing for a visit from the cousins, when a flying saucer lands in their yard. Moe yells to Shirley who, upon seeing the foreign object, mistakes it for an oversized, and impractical, newly-purchased barbeque. Soon, a small door opens and two small weevil-like (and adorably dressed) space aliens emerge. To Moe’s surprise, Shirley directs the visitors into the house. Moe is certain that the aliens will vaporize them! Shirley, ever the polite host, invites them to stay for dinner. After all, they must be hungry after all that space travel! The aliens graciously accept the invitation and vow to return at six o’clock. Immediately upon their departure, Moe is on the phone with the FBI. By 5:45, every armed service in the U.S. is parked in front of (or flying over) their house. Inside, Moe and the cousins imagine the worst about the pending alien arrival; Shirley reminds everyone to be nice. Outside, the two tiny guests ring the doorbell. They’ve arrived carrying a large box. Cousin Etta is certain it’s a bomb. Or a laser! The soldiers and tanks ready their guns; everyone waits with baited breath as Shirley undoes the wrapping. Then they all—the aliens, Moe, Shirley, the cousins, the soldiers, the FBI men, and the marines—sat down to a delicious spaghetti dinner together. A sweet and funny story about kindness, courtesy, and giving people a chance—no matter how different they may seem—Company’s Coming is great fun for the whole family.